[rcl-box type=’text’ content=’A beautiful coastal city set at the edge of British Columbia in Western Canada, Vancouver is a fascinating medley of bustling harbours, multi-ethnic towns cocooned within scenic vistas of water inlets, mountains, and lush rainforests. Teeming with a fantastic collection of dynamic city vibes fused in olden charm and nature splendor, Vancouver offers countless activities and interesting sights to explore. If you are short on time and looking to experience the best of Vancouver on your Canada visit for one day, here’s are the best hotspots we suggest to make the most of your one day Vancouver trip. ‘][rcl-box type=’image’ content=’https://o-travels.com/wp-content/uploads/rcl-uploads/post-media/6141/GrouseMountainandCapilanoSuspensionBridge.png’][rcl-box type=’text’ content=’Start your day with a delicious and hearty Canadian breakfast, after which gear up for a beautiful morning at North Shore region in North Vancouver. Enjoy a scenic drive through the iconic Lions Gate Bridge which offers amazing harbor views of Vancouver city. Continue till you reach Capilano Suspension Bridge where you can proceed for an expedition to explore the gorgeous Canadian wilderness with a hint of adventure. 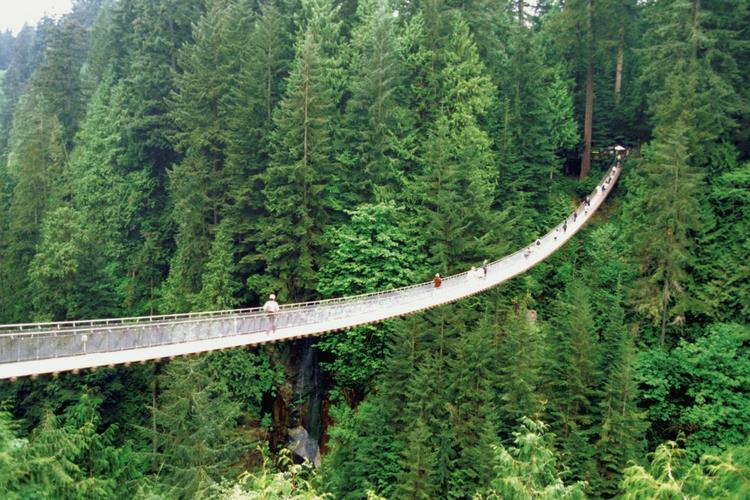 The Capilano Suspension Bridge is one of the popular places to see in Vancouver, the reason being its exciting array of attraction and adventure experiences. Walk across this 460 feet long suspension bridge while enjoying exhilarating views of Capilano River meandering beneath the bridge. Try the Cliff Walk experience and enjoy the tree top adventures – a series of 7 suspended walkways that gives you stellar views of the verdant coastal forests. Later, head to Grouse Mountain and step onboard a Skyride to enjoy breathtaking vistas of Vancouver city, Pacific Ocean and snow covered fir trees and mountain slopes. If you are visiting during winters, then you can take advantage of the powdery snow terrain and enjoy adrenaline skiing and snowboarding activities.’][rcl-box type=’text’ content=’ Gastown or China Town’][rcl-box type=’image’ content=’https://o-travels.com/wp-content/uploads/rcl-uploads/post-media/6141/GastownorChinaTown.png’][rcl-box type=’text’ content=’Gastown and China Town are two ethnic neighbourhoods that are must-visit Vancouver sightseeing. Gastown is a lively town which has over the years preserved its historic charms. A stroll through the town takes you back into the 19th-century era where you come across cobbled streets and Victorian buildings. The steam clock is a landmark attraction of Gastown and you can find many traditional art and shopping galleries that exhibit First nation artifacts. Just a few minutes away from Gastown lays a buzzing segment of China Town – the largest Chinese settlement in Canada. Here, you can eat, shop and explore the Asian cultural influence in Canada. Both Gastown and China Town are home to some of the happening restaurants, casual cafes, shops, clubs, and eateries and offer lots of options for souvenir shopping. Spend some delightful time in either of the towns and sample some eclectic epicurean experiences.’][rcl-box type=’text’ content=’ Granville Island’][rcl-box type=’image’ content=’https://o-travels.com/wp-content/uploads/rcl-uploads/post-media/6141/GranvilleIsland.png’][rcl-box type=’text’ content=’One of the things to do in Vancouver is to enjoy a shopping experience at Granville Island. This Vancouver attraction is a paradise for food lovers. While you are here, head to the Granville Island Public Market and saunter around to discover the lively markets filled with series of bistros and food stalls. The flavours and aromas of freshly baked food, the amazing sight of fresh seafood, farm produce and other gourmet cuisines will definitely tingle your taste buds. Apart from the lip-smacking assorted food scene, you can browse through art and crafts made by hundreds of artists, visit Granville Island Brewing, and splash around in Granville Island Water Parks if time permits. In all, you have impressive options to choose from over 100 stalls and artsy corners brimming with assorted merchandise. Here, you can literally shop till you drop and have a fun time with your dear ones. The public market is open every day from 9 am to 7 pm.’][rcl-box type=’text’ content=’ Stanley Park’][rcl-box type=’image’ content=’https://o-travels.com/wp-content/uploads/rcl-uploads/post-media/6141/StanleyPark.png’][rcl-box type=’text’ content=’Next in your ‘what to see in Vancouver’ list is Stanley Park – Vancouver’s largest urban recreational area. Set amid Vancouver’s modern city and surrounded by water, this green oasis is a refreshing breather for locals and visitors to get away from the urban life and reconnect with nature for few moments. Set on the northwestern rim of Downtown Vancouver, Stanley Park offers lovely waterfront areas, nature trails, blooming gardens and manicured pathways, kid-friendly recreational areas and a vast expanse of land covered in coastal forests of cedar, fir and hemlock trees. Visit Vancouver Aquarium where you can spot beluga whales and African penguins among other fascinating marine creatures. A stroll on the Seawell is an experience you should definitely not miss on your Stanley Park visit. It is a perfect space to escape the city life.’][rcl-box type=’text’ content=’ Vancouver Harbour Cruise’][rcl-box type=’image’ content=’https://o-travels.com/wp-content/uploads/rcl-uploads/post-media/6141/VancouverHarbourCruise.png’][rcl-box type=’text’ content=’Depending on how much time you have before you call it a day, you can experience the shimmering and serene views of Vancouver fading from day into night at Vancouver Lookout or with a sublime dinner onboard a Harbour Cruise. Vancouver Lookout is located at the SeaBus and SkyTrain Station, a few minutes away from the Cruise Ship Terminal and Gastown. A 40-second ride in a glass elevator whisks you to an observation deck 550 feet above the city of Vancouver from where you can view unparalleled 360-degree panoramas of the city and harbour front. The admission ticket for Vancouver Lookout is valid for a whole day so you can shift this Vancouver sightseeing as per your wish and even get a bird’s eye view of Vancouver on a bright, sunny day. For an enhanced evening experience in Vancouver, opt for a Vancouver Harbour Cruise which offers a charming sunset leisure cruise on calm blue waters along the Vancouver harbourfront and lets you view the spectacular city skyline and North Shore Mountains of Vancouver. As the sun dips into the Pacific Ocean, it is time to enjoy a West-Coast themed dinner amid the nonchalant ambiance and glimmer of Vancouver city and star-lit sky. The fine dining experience with Vancouver’s finest views is the best way to wrap up your Vancouver tour with memorable moments which you will cherish for a long time. – Vancouver is an all year round destination. Sunny days in Vancouver are pleasant to explore the city’s beautiful landscapes, festivities, and events. The best time to visit is usually Spring and Fall months. However, if you wish to experience winter sports in Vancouver, December to March are the best months for the ski season. January is the coldest month and July is the hottest month in Vancouver. – Travel planning is essential for Canada travel just like any other destination holiday planning. Make sure you chart out your dream Canadian holiday tour itinerary, get help from Canada travel experts to guide you through the holiday planning and Canada tourist visa procedures. Nationals of certain countries do not need a visa to enter Canada. However, if you are not in the visa exempt country list, you will require a valid Canada tourist visa prior to arrival in Canada. Also, a travel and medical insurance is a must for your travel duration in Canada for a hassle-free and smooth Canada vacation in case of any unforeseen incidents. – Vancouver is on Pacific Standard Time (GMT-8 hours) and observes Daylight Saving from March till November. The currency used is Canadian Dollars and electric plugs are Type A two-prong plug or Type B three-prong plug. Tipping 15 to 20% of the cost of service is expected in Vancouver. – Vancouver is a safe city. However, it is essential to be vigilant and follow safety precautions for a pleasant Vancouver holiday. Keep all your travel documents and valuables safe. Try not to venture into places you are not familiar with. If you are a solo traveler, it is best to take guided tours. In case of emergency, dial 911 for immediate response. – If you are looking for budget options, opt for public transportation such as Skytrain and buses to travel in Vancouver. You can expect to spend about 80 to 100 CAD a day in Vancouver if you are staying in basic accommodation options such as budget hotels and dorms and eating out at average restaurants. – Vancouver can have an unpredictable climate at times. Hence it is better to be prepared beforehand and pack essential clothing for a sunny day, some rain gear for unexpected showers and a whole lot of warm, woolen clothing if you are visiting during winters. You can wear layered clothing if you are not sure about the weather. In such cases, you can simply add a cardigan to your attire in case the weather turns windy or chilly. Also, pack comfortable footwear as Vancouver has loads of places that can be best experienced on a walking tour. – Canadians love their reputation for being soft, mellowed people with great amount of courtesy and patience. Hence, on your visit, it is beneficial to keep your best behavior in check to match to their politeness. Greet people with a smile, apologize if any harm was done and maintain queues diligently. – Vancouver has a medley of multicultural nationals hence it is also quite multilingual, but English is preferred and spoken widely in Vancouver. It is one of the cities in Canada with a high population of Chinese immigrants; hence Chinese is the second most spoken dialect in the city. While a single day is a very short duration to visit Vancouver, it will still manage to enthrall you with its spectacular sights to such an extent that you will end up either extending your stay in Vancouver or assure that you come back again to Vancouver for more.